Discussion in 'Headphones' started by purr1n, Oct 3, 2018. Some of the Nips brightness, to me, is the extra ringing in the lower treble. Cymbals in particular can sound more metallic than usual. It’s not too bad though, more just something you notice rather than complain about much. There’s a little bit of sharpness in a couple other spots, but generally well behaved and cohesive. Lyer25, Jinxy245 and cskippy like this. Yeah. I just noticed, a little bit more ringing duration near 5kHz with Nips on the CSD despite Nips looking just slightly less peaky in FR. Atticus has less long lived ringing lower at 4kHz. Quick, somebody post in Reddit that Toole and Olive are wrong about CSDs being useless. somehow I don't think that'll go too well haha. Enjoying the loaner aeolus now. Honestly it's very different from what I imagined from Zach's descriptions in the homepage -- thought dark, warm, and having atticus-like humps, far from neutral, and so forth. Aeolus are still fun headphones. But pretty surprised with the absence of mid-bass humps, partly because of open-back structure. Definitely there are good amount of trebles and decent top end extension too. However, high mids are relatively recessed to my ears, which probably contribute to "fun" character. Overall, the tonality is fairly balanced if not neutral. Like I already posted in profile, aeolus reminded me of empy. My perception is both share somewhat similar philosophy and tonality tuning (flatter bass but recessed mid). But I put aeo way higher than empy in terms of "technicality". While empy sounds more detailed, aeo can better resolve dynamics particularly in bass. I am also guessing aeo is better scaling too. Interestingly aeo sounds better with my current convert-2 than auteur with adi-2 & dac1421. I admit it's not a fair comparison.. but it hints how aeo scales with better sources -- where empy got an epic fail. Will hear more and elaborate my impressions from various angles. Needless to say will take measurements before sending aeo out. PS. Zircote wood looks fantastic. Love its dark brown color..
slankoe, Ash1412, Phantaminum and 6 others like this. Did some experiments regarding the amp pairing of aeolus. Aeolus is not as amp-picky as hd800. But it needs careful choice of the right amps. IMHO HD600/650 sound decent (or at least ok-ish) unless paired to poorly designed amps. Aeolus requires a bit more effort on top of that. Slightly forwarding amp seems to be favored. EC, Schiit, or THX-variants may be worthy considerations. Head-stage is very solid no matter which amp was paired. Good thing in my book. I also put a score of 0-10 with 0 being the least recommendable and 10 the most recommendable. EC Black Widow (9.5 out of 10): Afaik Zach didn't own bw. But aeolus sound as if they were voiced based on bw. -0.5 because of OOP. Outperforms anything else listed below by a meaningful margin. Schiit Jotenheim (prol later gen, 8.5+) and MD THX (7.5): Both are similarly good. But with HQ balanced hot signal, Jot easily outperforms and outresolves THX. Also forwarding nature of jot better suited a tad laid-back nature of aeolus. For great unbalanced source, gap will be reduced to 0.5 or so. Also, while I typically prefer high-gain of schiit amps, in this specific paring, low-gain did more justice to my ears. Woo WA5 (7.0): Not bad but not worth it, either. No WOW. For aeolus, I will take the above two over this any day. Note that I like this amp second best among listed when paired with hd800, ignoring price and value. MD LCX (6.0): Couldn't match to aeolus technicalities. Tonality also feels a bit mismatched. AGD NFB1 (maybe 2017 model. 4.5-5.0): Fortunately their amps are at least better than their r2r dacs. Much tolerable. Needless to say spending the same money for jot or thx is way much wiser. Topping A30 (3.0): it transformed aeolus' treble to a very painful experience, which was not true at all with any other amps. slankoe, yvv, Aeron and 7 others like this. I definitely had the painful experience when running it out of my LCX, literally 10 mins of play time before having to take a break. Maybe I might expose myself to lcx too shortly. Had to compare multiple amps together. Eikon - Too bassy for my personal preference but pleasantly surprised by how well it was done and how good the technicalities were for a bass heavy headphone (something I haven't experienced that much of). Also amazed that it could have that much slam and punch without being fatiguing (for me). Like the sound and tone of the bio cellulose driver. Auteur - Mids and highs done well, very well, more cohesive mid and highs (as an overall picture/sound) than anything I own, but bass wasn't all there. Low bass and high bass sound "missing" in many songs. Not as much of a bass presence as other ZMF unless it was specifically a thumpy mid bass. For example, a rolling bass line by a bass guitar or string bass would sound muted/missing prescence, not fast/coherent enough, slightly distorted. This is even on the Mogwai which to me has a very thick sound with more than enough bass. Maintained a nice airiness on the Liquid Platinum. Least colored of ZMF headphones. Something I can't place my finger on in the tone could be better, but good enough that I'm happy already. Aeolus - A little more bass than Auteur, a little more sub-bass as well, but the mids and highs were not as clear (i.e. technicalities not as strong, still better than many others in ~$1000 range) and something in the upper bass and to a slight degree the whole sound just wasn't cohesive to me. Not as fast or accurate as Auteur in mids and highs, but only slightly behind. With that being said, probably the one I found the most fun in the entire ZMF line up and is what I'd buy if most of my current headphones were better at technicalities and more neutral (they're not bad at technicalities, just that ZMFs overall are a little better). Verite - IMO better at technicalities and sound stage vs. anything I currently own (HD800 and Utopia are still better at resolution and a few other things, I just don't like either of these that much for most music). Wasn't fond of the (roughly) W shaped sound signature, IMO the tallest part of the W is actually the middle peak, and this just isn't a sound signature I'm a fan of (although yet again, it amazingly had more mids without being harsh). Overall - very well done headphones, few actual weaknesses or shortcomings, definitely colored in a good way and probably not an only headphone candidate like many have said before me. Yet, none are colored in a way that currently scratches my itch... but 3 of them are 90-95% there and I imagine 2 of them would do it if they could be slightly modded. Other info: Used all 4 with ampsandsound mogwai first, then Auteur, Aeolus, Verite with Hugo TT2, then Auteur only with Liquid Platinum at home, overall impressions largely the same for Auteur on all 3 even with the distinct sound of each setup. - Has anyone modded their Verite to have a little less mids without losing other attributes? This would probably be really awesome headphone for me. - Has anyone modded their Aeolus to have a little less sub-bass and a little more upper bass without changing other attributes/qualities too much? This would be a perfect "fun" headphone. - Could either of the above two be changed by just having different wood? From what I've read here and elsewhere, I'm guessing no, but on the flip side different wood in string instruments, pianos, and drums can change the sound a lot. -Edit: Any amp/dac combos that could change the above (without EQ)? TazerMonkey, ColtMrFire, sheldaze and 3 others like this. Aeolus with the Verite pads is an easy recommendation and fixes most of my issues with the stock pads. It does get a ~1kHz bump, I think @Vtory said the Suede pads were even better? He should have some measurements up hopefully soon. Jinxy245 and Elnrik like this. Full set of measurements will be posted tomorrow or so. Aeron, 9suns, JoelT and 10 others like this. @fp627 Interesting write-up. Did you use both pads w/ Auteur? To my ears the Eikon pads elevated the bass, although I prefer the Auteur pads. Also, I wonder what wood you were listening to? DISCLAIMER: I love my Blackwood Auteur. Aeron and jazztherapist like this. Interesting. I've been spending the last week with a new pair of Teak Auteurs on my Mogwai SE and I've been pleasantly surprised by the low end. Granted, I was coming from Atticus and Eikon and looking to open up and flatten the sound a bit. But I was fearing a big pendulum swing and was relieved to hear bass authority intact. What DAC and tubes are you using? I haven't rolled tubes with the Auteur yet, but I've had a pair of Bendix 6384s that Justin had recommended for precisely this sort of deployment. Very present on the bottom but nothing bloomy about it. @lcmusiclover - Yes, both pads were used. I positioned the pads and headphone at various angles and adjusted the "size" quite a few times as well to make sure I was getting a good seal, etc. Wood was the teak if I'm not mistaken (looked like teak wood and default option I believe). @jazztherapist - Stock tubes on Mogwai at TSAV. Questyle DAC but I can't remember which one right now. Also used on their Hugo TT2 with Hugo M Scalar and had roughly the same impressions. On my LP, it was used with Soekris 1421 and the LP is running Telefunkens (old Telefunken production 6922, not the Philips or some of the other ones that mfg for Telefunken). For reference, I don't have the same feeling w/ the bass when I use other tubes in LP or with other amps at home. Nor with other headphones on the Mogwai SE (which I'm a little familiar with, have heard it a few times). This was most noticeable in jazz and rock or metal songs with songs that have very familiar bass lines to me (and that I can hear the same bass lines clearly on all my other stuff, even with a "simpler" chain such as SDAC > Meier Corda Rock ff > HFM HE4xx or HD595 or even UE5 or HD595 directly into Macbook). I initially thought I had a hard time hearing bass b/c of a fit issue or b/c other people were listening to the speaker systems or from people talking at TSAV knowing that many had said ZMF house sound has probably a little extra bass. But when I heard the same at home I realized it was something in the Auteur. And no, I wouldn't say I'm a basshead nor was I expecting slam or something big in the bass. Just to be able to hear all the individual notes in a rolling bass line/riff clearly. Lastly, I had other people listen to the Auteur (granted they are bassheads and like V and U signatures) and they both said a lot of the bass was missing without any input from myself. @Vtory - Thanks for the graph. Verite graph here seems to confirm what I've heard (given the natural freq response of human hearing + the graph that shows how much sound needs to decay at each freq to be perceived the same, I forget the name of the graph right now at 2AM). It also seems to back up that I probably can't tame the W enough (per above question) with new woods, but I may still be do-able with the other pads or modding/tuning. Listened to 4 ZMF for a few hours last weekend at TSAV, and borrowed an Auteur for last week (with both pads). Verite - Wasn't fond of the (roughly) W shaped sound signature, IMO the tallest part of the W is actually the middle peak, and this just isn't a sound signature I'm a fan of (although yet again, it amazingly had more mids without being harsh). Just for comparison's sake here's a graph of a classic W shaped headphone, the Denon D7000 compared to the Verite with Verite pads. I kind of think of the Verite as a general downslope with forward mids. You'll see Universe has a little but more forward mids/fullness in that 800 hz on down area. SO - I don't think any modding is needed - we make all the pads to help everyone find their preferred taste - the Verite pads should do what you're looking for - unless ofcourse that's what was on them, but we do ship with Universe pads on them. Aeolus could be modded by having more ports in the front baffle to get rid of sub-bass without losing mid-bass - BUT I wouldn't overall recommend it generally. The Atticus is a good example of a headphone where I intentionally did this, reduced the sub-bass by adding more frontal ports to the baffle, just because there's SO much mid-bass that without it being a hump, the headphone sound more bloated. IMHO the aeolus has a tasteful amount of mid through sub-bass where that's not needed and between all the pads a good spot can be found for just about everyone. YMMV and all that OFC! We are going to have the Universe suede perf pads for aeolus on the site soon! Sorry for the wait on those, they are great with aeolus. By soon I mean like this week! The wood doesn't change FR but it DOES change the transient edge and perceived fullness associated with that - the damping does go up with a harder wood so bass sounds more impactful, full and meaty despite the FR being the same. This may actually be your answer to the auteur, as because that biocel driver has a slight diffuse quality to it along with our design, the harder wood does sound meatier with less decay than the teak. The auteur is definitely affected the most by wood changes because of the driver and design this way. At shows etc when people listen to auteur and want more bass I usually just toss a Bocote, Blackwood or Cocobolo set over to them and they are happy. 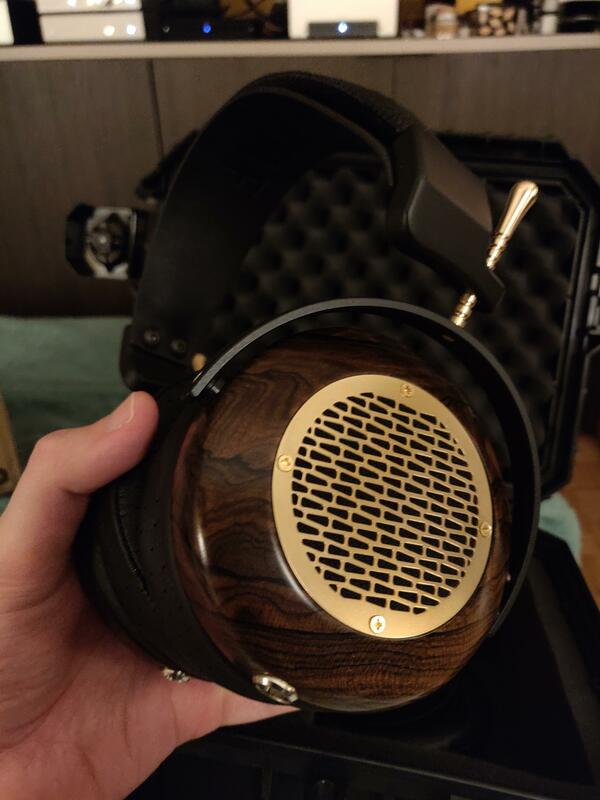 When you're coming from HD800 the teak sounds quite full in contrast. It's good fun figuring out which combo works for each specific taste! friedrice83, ChaChaRealSmooth, ColtMrFire and 15 others like this. Pads are worth swapping, but take it from me, don’t bother with additional mods beyond putting stuff over the driver (or not). The Verite is a relatively stubborn headphone and wants to sound the way it sounds. You either like it or you don’t. daniellistens, pavi, fp627 and 3 others like this. I haven’t heard the Verite yet, but I’ll be able to compare it to my Utopia and Autuer next Saturday at the Meet in Louisville. If anyone wants to learn more, lease shoot me a PM. Additionally, I haven’t noticed the Autuer being bass shy. On the WA5 it kicks like a mule, maybe I’m not a bass head, but I find the Autuer to be eminently musical. Though I believe musical presentation is built into all of Zach’s headphones. Lyer25, jazztherapist, David De Lucena and 2 others like this. Sorry for the wait on those, they are great with aeolus. By soon I mean like this week! So that's the delay in shipping, I'm sure the show had nothing to do with it! BTW, EU loaner for Aeolus and Veritè is open. Aeron, Walderstorn, quick and 1 other person like this. I'm more or less experiencing that right now. Anyway, moving on, I got the review Verite from Zach Friday night (as well as my Teak Auteur.) However, I didn't get to hook everything up until last night. These first impressions should be taken with a grain of salt because I was exhausted and was hyped up on "Snowmeggedon: St. Louis" doomsday talk as I was driving the family from Indiana. My first impressions: The Verite is super clear, and makes me think of AudioTechnica's sound if it wasn't made for J-pop. That doesn't make any sense, but my brain keeps spewing that out. It's noticeably less "full" in the bass than the Auteur is, but I need to compare it more. I don't know if it was my exhausted brain, but it was noticeably faster in the mids and highs. Again, take these impressions with a grain of salt. I need to listen to them more. Aeron, Overkill Red and jazztherapist like this. Anyone who didn't order brass trim on their ziricote nips is missing out. Also, zach really needs to start labeling pads. I think I have 10+ sets and I'm staring to dread putting one in the wrong bag. Aeron, daniellistens, zach915m and 13 others like this.